TEL AVIV — Israel on Wednesday denied "baseless" rumors that it plans to hand the Vatican control of a building where Christians believe Jesus held the Last Supper. Orthodox Jews have been plastering posters around Jerusalem claiming that Israel is about to relinquish control of the room ahead of a visit and planned Mass by Pope Francis next week. 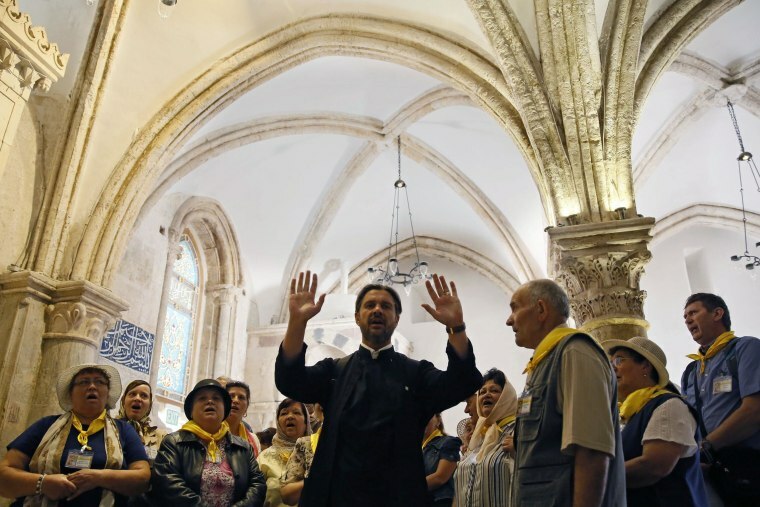 Religious Jews revere the building on Jerusalem's Mount Zion as the tomb of the biblical King David and say it must not be used for Christian prayer. Writing in response to the claims Wednesday, the Israeli foreign ministry said: "The rumors about handing over the ‘Last Supper Room’ to the Vatican are baseless. "This is part of an attempt to stir things up in the field, and to cause tension around the Pope’s visit." Christians are currently allowed to pray there for two days each year, but the Vatican has for years petitioned Israel to give it more access. A senior Catholic official told Reuters last week that the two sides were close to a deal allowing official daily prayer there, but not a transfer of control. Wednesday's statement added: "It should be emphasized that there is no intention of handing over or giving any rights at the ‘Last Supper Room’ to the Vatican, not during the Pope’s visit in Israel, and not after it. "The State of Israel is keeping its traditional stand, according to which, the ‘Last Supper Room’ and every part of that defined area on Mt. Zion, will not be transferred to the Vatican’s ownership or to its possession in any way." Reuters contributed to this report. Alexander Smith reported from London.